With 2017 just beginning and goals falling by the wayside every millisecond, we want to make sure we kick off this new year right. Most people aren’t necessarily fans of new year’s resolutions, largely because they are so hard to follow and keep up with. However, Rollins Landscaping loves making resolutions. Our resolution has always been to continuously strive through helping our customers achieve their dreams while having an exceptional experience working with us. What an awesome new year resolution, right? We think so. I can proudly say, this is a resolution we have not yet failed at. GO TEAM ROLLINS! We have already kicked off 2017 with some awesome landscaping projects and we hope you will be one of them. We love customers who have creative landscaping dreams, as we believe personalized, engaging customer experience is critical for the success of our business. Just like the ol’ saying goes, “if you’re not happy, we’re not happy,” and might I just add, we love to be happy and have happy customers. 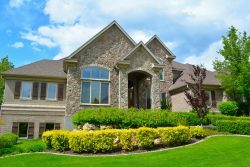 If you didn’t already know, we provide landscape services anywhere from design consultation to finished custom landscaping and almost everything in between. We want you to feel comfortable with us to complete any of your landscape projects. When you think landscaping think Rollins. Mostly because it rhymes.. Well kind of. All in all, I can say with confidence that you will always be so impressed with our work that you won’t want to go anywhere else but Rollins for future landscape projects. So let’s start this year off right. If you are in the market for a new or resurrected yard, start thinking about what you want and we will do the rest. We can assure you, you won’t be disappointed!